If you’ve ever felt like you can’t face watching the news then you’re not alone. Research shows that people often feel so dispirited by the overwhelming negativity of the news they’d rather not tune in at all. Evidently, where the media puts its focus affects how we view the world and impacts our actions. 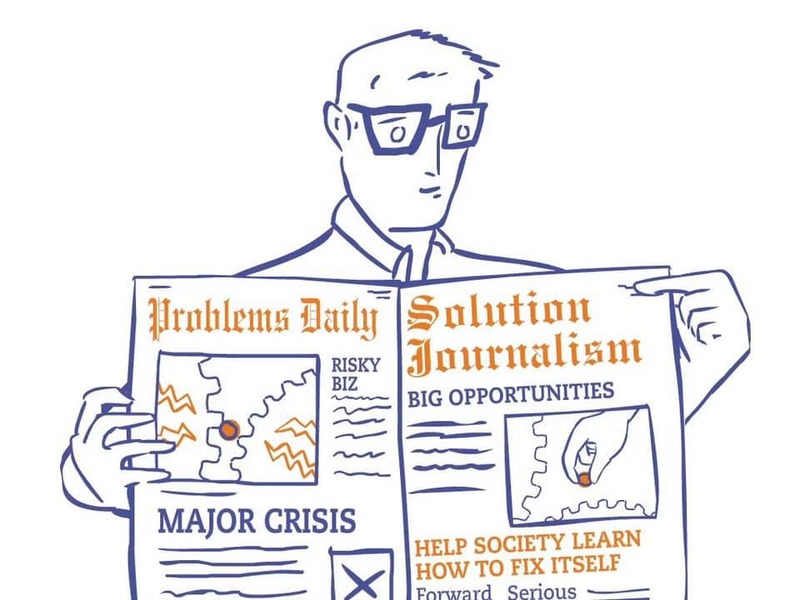 That’s why Solutions Journalism Network (SJN) reports a story by relaying the problem – as well as a next step in solving it. In a survey carried out by SJN, people were given a news story to read in a standard format and others were given a Solutions Journalism format. Those who read the solutions coverage reported they had gained knowledge about the issue in the article and believed they could contribute to a solution. As well as this, people reported feeling inspired and optimistic after reading the article and indicated they would read more articles by the person and publication and be more likely to share or discuss the piece. By providing audiences with the knowledge to try and address problems themselves, the discussion moves beyond what has happened and looks to where to go next. Critics argue that Solutions Journalism means reporters approach stories with a desired ‘outcome’ in mind, and that attempts to bury the negative could make coverage inaccurate or mean it lacks in rigorous, evidence-based research. Proponents of ‘SoJo’ argue that these methods are not about light journalism over hard-hitting reportage, and detail ways that writers and news broadcasters can avoid classic mistakes such as ‘hero worship’, ‘Silver Bullet or ‘Favour for a Friend’. Every report on the spread of the Zika virus with an emotive headline or graphic picture could also feature examples of mosquito control programmes that have worked. Reporting statistics which tell of failing schools could be paired with projects striving to counter youth exclusion. Even those initiatives which ultimately fail can provide meaningful insight on the ways to tackle problems. From giant news corporations to smaller platforms like Atlas of the Future, Solutions Journalism is making news more responsive, compassionate and ultimately more shareable. Reflecting the way we live our lives today, small changes could reset the tone of public discourse and help to bring about long-lasting change. Solutions Journalism Network introduce journalists to the practice of solutions journalism through newsroom trainings and webinars. Click here to request a workshop and join the online hub here. Tags: Awareness raising, Communication, Culture, Empathy, Identity, Information, Language, Media, Mentoring, New York, Platform, Storytelling, Training.